Feedback – Is it even necessary anymore? Feedback is an issue that causes much angst to sellers both on eBay and Amazon. Many times the negative feedback left is irrelevant to the transaction especially when the buyer has not even contacted the seller. So I ask you – Is feedback even necessary in 2009? How many buyers even review a seller’s feedback? On Amazon the seller’s feedback is pretty much hidden, especially if the seller has the coveted “buy-box”. It is also extremely lopsided since so few buyers actually leave feedback on Amazon. On eBay many buyers do not understand the feedback percentages and don’t take the time to review the comments. This is obvious when you see a seller with 89% feedback, yet all their 99 cent junk auctions have bids. So what other mechanisms could replace feedback and help reduce scam sellers? Both eBay and Amazon already have the mechanisms in place, they just don’t publish the information derived from these mechanisms to the buying community. Amazon has the A to Z Guarantee and eBay has the Paypal SNAD and INR dispute consoles. Just these programs could be used to guage a seller’s trustworthiness. Yes, I know there are claims that are decided against the seller unfairly, but truely, if you are a professional seller what is going to be your percentage of these claims? It should be extremely low. By publishing the sellers number of transactions, as well as the number of claims decided against them, should be enough for a wary buyer to determine if they want to do business with the seller or not. Or to take it one step further, the venues could be more responsible for their sellers. Amazon tracks A to Z claims, amongst other criteria, and supposedly takes steps to limit sellers who do not meet their criteria. eBay is attempting to do the same thing, but not with very good results. If eBay would focus more on their seller relations instead of on Worst Match, they could come up with a logical and fair way to rate sellers and determine which ones are not performing to expectations. To sum it up – What do buyers want? They want to shop on eBay and Amazon and buy what they want and know they will receive what they bought in a timely manner. They want to trust that eBay and Amazon are offering them products from reliable, honest sellers. They don’t want to have to spend 2 minutes researching the seller before making a purchase. I believe that buyers want the venues to vet the sellers, not make the buyers do that themselves. So do away with feedback, monitor the sellers, and let the buyers do what they do best – BUY! Good morning again from Vegas. Day 3 of the conference was a whirlwind of new information and new people. Some of the presentations were very detailed, while others were more basic. I was happy to find out we had registered several new members of IMA as a result of our free seminars for ASD/AMD members on “Getting Started in E-Commerce”! Great job everyone! The first presentation was on Market Intelligence, by Tim Williams from QL2. 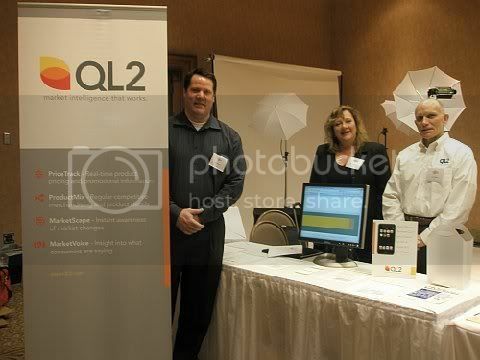 QL2 is a company that has helped many very large, well known retailers with market intelligence in order to increase their market share. I was not one of the top 200 Ebay sellers invited to the Ebay Ecommerce Summit last week where Ebay announced the changes to Fees, Search, and Feedback. I was one of the lower volume Ebay sellers on the sidelines at home waiting to hear the long awaited announcements about fee reductions. As we all know now, the fee changes will probably hurt more Ebay sellers than they help. The changes overall made me ask myself how the new CEO designate of Ebay, Mr. John Donahoe, can make changes to Ebay’s platform that blatantly copy the Amazon platform without feeling a bit unimaginative. Mr. Donahoe has been at Ebay since March 2005. If you would like to check out his salary on Forbes Mag. Is Ebay going to become Amazon Lite? The new final value fees (FVFs) for Ebay stores are just slightly less than Amazon’s FVFs are now. Not allowing sellers to leave negative feedback for buyers is similar to the Amazon feedback system. The star rating system is similar to the Amazon seller rating system. Amazon already has a relevance based customer search that sounds like the “finding experience” Mr. Donahoe has been working on, and which is scheduled to be rolled out to Ebay this year. My guess is it is time for us all to examine the Amazon sellers marketplace because the new CEO-designate of Ebay seems to want the Ebay buyers experience to be just like the Amazon buyers experience, and will probably continue to imitate Amazon features. Wasn’t it just 2 years ago that eBay wanted to bring back the “vibrancy” to core by encouraging 99 cent starting bids? In 2006 they decreased the listing fee for the 99 cent starting bid while increasing the costs for eBay store listings. eBay felt the need to go back to their roots – the auction format. So it was with shock that I read the new fee structure. eBay’s 99 cent auction sellers are no longer the darlings of eBay. They have been hit the hardest by the new fee structure. Because the traditional 99 cent auction sellers generally have a very high sell through rate, they are being hit hardest by the large increase in Final Value Fees. Although their insertion fee has decreased by 5 cents it’s nowhere large enough to make up for the 3.5% increase on the backend. Yet Fixed Price sellers, who generally have a low sell through rate, have seen their insertion fees decrease greatly, especially the majority who use gallery. They still pay the increased FVF, but the decreased insertion fees will more than make up for the increase in FVF’s for those seller with sell through rates below 50%. An odd thing happened this holiday season on Ebay. I had an buyer that decided the Amazon return policy was much better than my return policy. I have to admit that having 30 days (Amazon’s policy) to return an item is much better than 7 days (my policy), and I did refund my customers money when the item arrived 30 days after we agreed she would return the item. But the incident got me thinking. Is Amazon setting the standard now for internet buying customer service? Other Ebay sellers have reported that buyers are asking to return items up to 60 days after a sale. Some Amazon sellers are reporting packages being returned from Amazon buyers more than 30 days after the buyer received it. One of the most interesting aspects of internet selling is anonymity. The mild mannered insurance salesman sells hardline harley motorcycle gear on the internet. The shy Ohio housewife sells racy red silk lingerie as Mimi an immigrant from Paris France. Because the buyer on the internet can’t see a balding head, or mousy dress, and make any assumptions. This type of anonymity has positive and negative consequences to an internet business. The positive consequence of anonymity is that discrimination, or generalization due to a sellers appearance is all but eliminated, but it also creates a problem. It is difficult to create buyer trust for an internet product, or seller. In a typical brick and mortar store a wary customer can converse freely, and develop a bond with a seller leading to a purchase. On the internet, there are very few opportunities for conversation and/or communication of any kind before purchasing. So, for an internet seller, the buyer will trust you as much as they trust the venue you sell in. In other words, we internet sellers are at the mercy of the reputation of the venue we sell in.